One of the many defining characteristics of the Film Brat generation of filmmakers is their inherent affection and thorough knowledge of the medium. They were second-generation artists, the spiritual successors to early pioneers like Alfred Hitchcock, Howard Hawks, DW Griffith, King Vidor, and several others. They were born after the language and conventions of cinema had been firmly established, which meant that the very nature of their own roles in the medium needed to question and rebel against those very foundations. In order to do so effectively, they naturally would have to be well versed in the medium’s history, major works, and key players. This cinematic literacy is common amongst the second-generation of filmmakers, the first to benefit from a formalized film education—but of all those directors, none were as arguably immersed in the art of cinema than Martin Scorsese. As a sickly child barred from outdoor activities, the majority of Scorsese’s formative years were spent in movie theatres voraciously consuming anything and everything that was released. 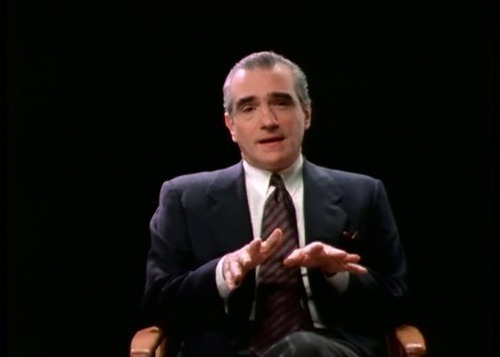 Scorsese’s work is littered with references, homages, and techniques gleaned from his influences, and in 1995, he decided to pay tribute to his cinematic forefathers with the feature-length documentary A PERSONAL JOURNEY WITH MARTIN SCORSESE THROUGH AMERICAN MOVIES. Produced by the British Film Institute and aired in three parts on the UK’S Channel 14, A PERSONAL JOURNEY unfolds over the course of three and a half hours (!) in a series of on-camera interviews and film clips. Scorsese plays host and narrator, framing the role of the director as that of a storyteller, an illusionist, a smuggler, and an iconoclast engaged in an eternal push and pull against the studio. Through this framework, he presents a survey of the art form’s development from its birth to around 1969: the early silent works, the transition to sound and color, and finally the advent of Cinemascope. He focuses acutely on the genres that shaped him directly—the western, the gangster picture, and the musical—and spends a significant amount of time charting the growth and development of those genres. Further solidifying his social connection to the Film Brat community of directors, Scorsese sees fit to throw in filmed interviews featuring George Lucas, Francis Ford Coppola, Brian De Palma and Clint Eastwood, along with older filmmakers like Arthur Penn, Billy Wilder and Samuel Fuller. There’s even an appearance by Scorsese’s own personal mentor, indie pioneer John Cassavetes. Because A PERSONAL JOURNEY is mostly comprised of pre-existing film clips, there is very little original material besides interviews that had to be generated. To this end, the film employs a combination of three cinematographers: Jean-Yves Escoffier, Frances Reid and Nancy Schreiber. Despite the presence of new cinematographers and a new producer in Florence Dauman, Scorsese surrounds himself with familiar collaborators like Thelma Schoonmaker (overseeing an edit by Kenneth Levis and David Lindbom), Saul Bass (turning in a series of minimalistic, hand-drawn intertitles), and Elmer Bernstein (composing a quietly nostalgic, piano-based score). However, it’s not just the returning collaborators that mark A PERSONAL JOURNEY as an inherently “Scorsese” work—his signature is evident in the documentary’s fundamental conceit of celebrating America’s major role in the medium of cinema. Scorsese’s presentation is informed by a lifelong passion for movies, and as the narrator/host, he is able to penetrate the fourth wall and address the audience directly in his bid to reiterate the importance of our filmic legacy. One very interesting anecdote finds Scorsese describing one of the very first films he ever saw in a theater, King Vidor’s DUEL IN THE SUN(1946)—an epic western starring Gregory Peck—as a revelatory experience in the range of narrative that cinema was capable of telling. This observation is all the more poignant knowing that Peck himself would later make his last film appearance in Scorsese’s CAPE FEAR (1991). Anyone with a self-described love for cinema or Scorsese’s artistry owes it to their selves to watch A PERSONAL JOURNEY. It’s an exceedingly intimate portrait of Scorsese and his artistic worldview as informed by those who preceded him, and his refusal to comment on his own work or those of his contemporaries in the context of the documentary points to a fundamental respect and dignity that is sorely missing from most working directors today. In its decision to focus exclusively on American cinema and its development, A PERSONAL JOURNEY barely scratches the surfaces of the wider story of film—but at three and a half hours long, it’s clear to see that Scorsese’s focus, while narrow, is exceedingly thorough and endlessly informative. With the completion of A PERSONAL JOURNEY, Scorsese doesn’t just take another step in his personal development as a documentary filmmaker, he establishes himself as America’s pre-eminent film historian and the guardian of its legacy to the world. A PERSONAL JOURNEY WITH MARTIN SCORSESE THORUGH AMERICAN MOVIES is currently available on Youtube (give or take a few sequences) via the embed above.